Invest in a fast acting fungicide that achieves high levels of long-term disease control for turfs such as golf greens, which require professional maintenance. Medallion TL is a highly effective fungicide with Contact+ activity which is best used as a preservative or at the very early stage of disease pressure which delivers outstanding levels of disease control and provides a long lasting shield against disease. We highly recommend the use of Medallion fungicide from November through to March when temperatures are below 7 degrees for powerful and precise control of pathogens responsible for turf diseases encountered during this period of time. Medallion Fungicide is commonly used to prevent key turf diseases such as; Microdochium (Fusarium) Patch, Anthracnose and Leaf Spot. 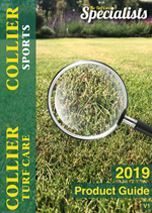 Its Contact+ activity tackles damaging pathogens on the leaf, thatch and soil surface to use the fungicidal activity of the active ingredient with maximum efficiency. Medallion TL should be used as part of an annual fungicide programme in conjunction with other Syngenta fungicide such as Banner Maxx, Heritage Maxx and Instrata. It is recommended for use on all managed amenity turf and amenity grassland. Tip: Medallion TL can be used with Greenmasters Liquid High K 3-3-10 and Greenmaster Liquid Effect Iron Fe to improve the control and recovery of your turf both before and after a disease attack.